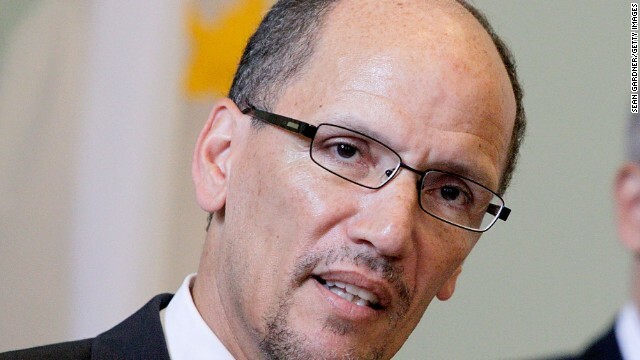 (CNN) - Thomas E. Perez, now the U.S. assistant attorney general heading the Justice Department's civil rights division, will be nominated to be the next secretary of the U.S. Department of Labor, a Democratic source said. A former federal prosecutor and official in his home state of Maryland, Perez was sworn into his current post in October 2009. If approved, he'd take the position recently held by Hilda L. Solis, a former congresswoman who resigned in January. In a letter to colleagues announcing her departure, Solis said she'd "taken our mission to heart." "As the daughter of parents who worked in factories, paid their union dues and achieved their goal of a middle class life, and as the first Latina to head a major federal agency, it has been an incredible honor to serve," she wrote. - Findings that controversial Sheriff Joe Arpaio of Maricopa County, Arizona, engaged in "a pattern or practice of unlawful retaliatory behavior against perceived critics." - Findings that New Orleans police used excessive force, made unconstitutional searches and illegally profiled people based on race, ethnicity and sexual orientation. - Standing with Muslims trying to build a mosque in Murfreesboro, Tennessee. Before rising to the Justice Department position, Perez led Maryland's Department of Labor, Licensing and Regulation. This office is charged with "safeguarding workers, protecting consumers, providing a safety net and cultivating a thriving workforce," according to its website. Perez also was on the Montgomery County Council for four years, between 2002 and 2006. He'd earlier spent 12 years as an attorney in the Justice Department's civil rights division, rising to become deputy assistant attorney general during the 1990s. Perez also worked for late Sen. Edward Kennedy, a Massachusetts Democrat, and spent the final two years of President Bill Clinton's administration as head of the Health and Human Services Department's civil rights office. I certainly hope Rand Paul, John McCain, Lindsey Graham or some other useless bag of protoplasm from the Republican party plans to block this nomination in the Senate. We can't allow our government to function as the Constitution designed it! We need to check with Grover Norquist or Rush Limbaugh first! And, the tea potters once again will filibuster for no apparent reason. Will Rand Paul, John McCain, and Lindsey Graham have the nerve to mindlessly filibuster somebody with a Hispanic surname? They love behaving like spoiled children but the GOP is sucking up to the Latino community big time. No doubt the Republican senators will find him unqualified.